On a crisp Sunday evening, as the Los Angeles sky shifts from bright azure to sapphire blue, the lights come on at the Sowden House in Los Feliz revealing the building’s Mayan temple silhouette. In the pool, an artist is installing a kinetic sculpture that rotates in the breeze. In the living room, three dancers in flapper dresses go through a sequence of slow, undulating moves. And in the courtyard, a man in a cape cruises through, his head crowned with a bright, feathered headdress. 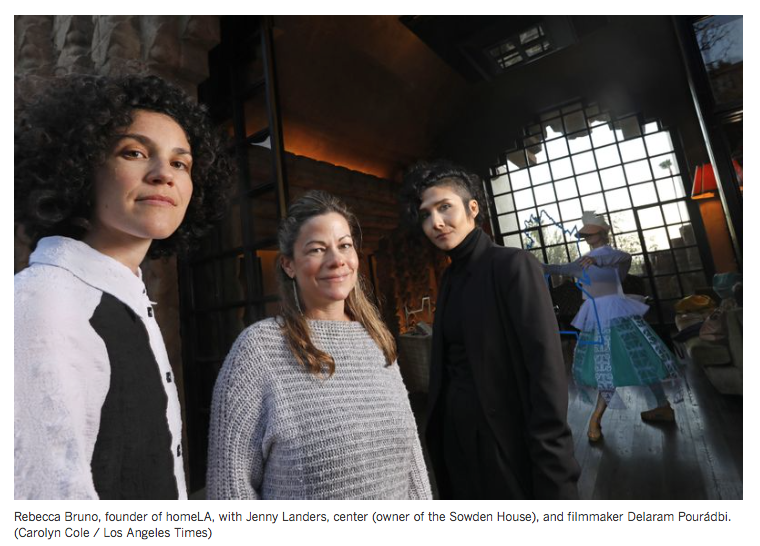 This unusual gathering isn’t a dream, but a rehearsal for the immersive installation “Passages at the Sowden House,” organized by homeLA, which is a project that creates site-specific performances in private homes around Los Angeles. Led by artist and dancer Rebecca Bruno, the project will stage two public events at the 1920s Sowden House over the weekend, featuring a mix of dance, live music, performance art, sculpture and film. 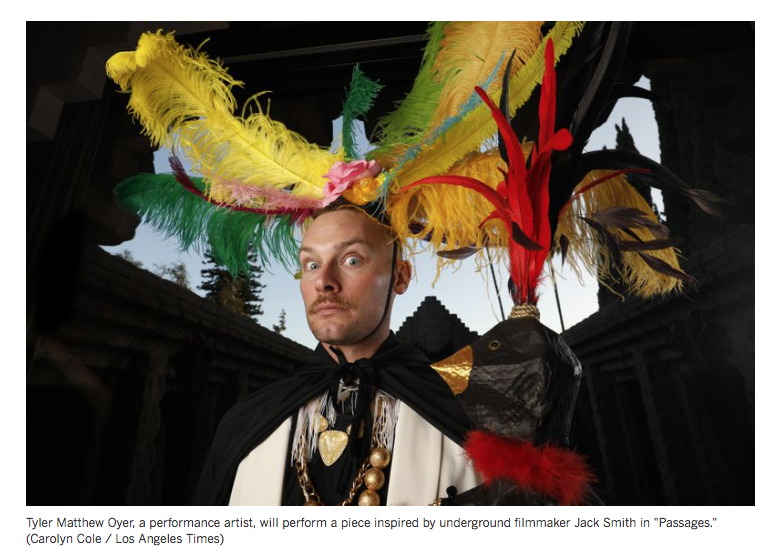 This will include a performance by experimental vocalist Odeya Nini, a movement piece choreographed by Cheng-Chieh Yu and a performance by Tyler Matthew Oyer (he of the cape), who will channel the spirit of the late artist and underground filmmaker Jack Smith. 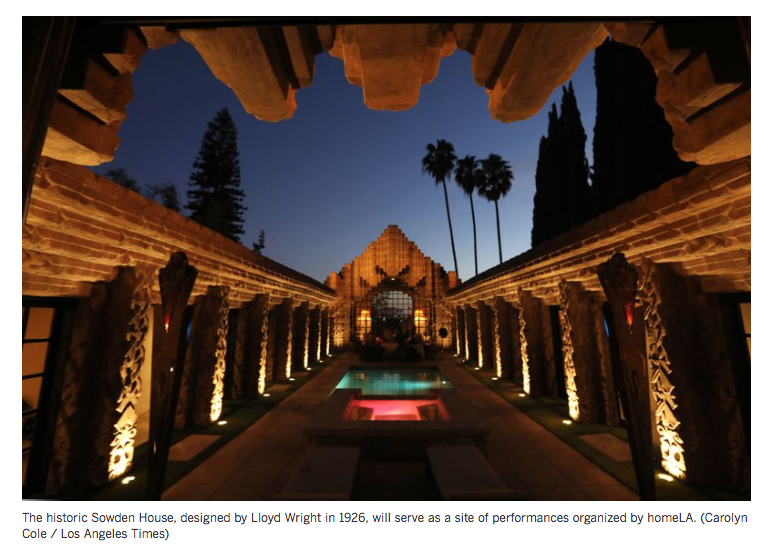 Visitors will be invited to move at their leisure through the performances in the home, designed by architect Lloyd Wright (son of Frank Lloyd Wright) for photographer and painter John Sowden and his wife, Ruth, in 1926. As part of the process, Bruno collaborated with filmmaker Delaram Pourábdi to create a meditative five-minute film inspired by the house that will be incorporated into the show. “Passages,” as the film is also titled, follows Bruno as she improvises movements inspired by the home’s theatrical architecture: the courtyard flanked by Mayan Revival columns, the pyramidal facade, the rich, interior spaces. The project got rolling about a year ago when the home’s owner, Jenny Landers — she and her husband, Dan Goldfarb, have owned the house since 2017 — reached out to Bruno about using the Sowden House as a site for a homeLA project. Landers, an aficionado of dance who is also a dancer, says the performance is an opportunity to resuscitate the home’s original purpose: as a stage. Wright’s intent when he designed the structure was to create a house that could easily host performances and other artistic events. Laid out in a rectangle around an open, interior courtyard, the home has rooms at the northern and southern ends that can be opened entirely to the elements. Moreover, the northern space functions as a small stage. “The acoustics in here are incredible,” says Landers. “If you play an acoustic guitar in here, it sounds amazing.” It’s a feature that makes sense given that Wright also designed one of the original band shells for the Hollywood Bowl. Bruno, who had never been inside the Sowden House before being invited to perform, says she jumped at the chance when Landers reached out. The house, however, harbors darker legacies too. The Sowdens remained in the house for only a few years, after which it went through a number of hands. From 1945 to 1950, it was owned by a doctor by the name of George Hodel. In 2003, his son, Steve Hodel, a former homicide detective, published a book in which he theorized that his father had been behind the gruesome murder of 22-year-old Elizabeth Short in 1947 — the Black Dahlia — and that the killing had likely taken place in the basement of the Sowden House. All of the artists in the show, notes Bruno, have had to contend with that violent narrative as part of their research — whether they ultimately engaged the story in their work or not. With the performance, she aims to “bring a positivity” back into the space. Part of that has consisted in opening the doors and once again letting the home serve as a space in which to make art. Bruno, in addition to screening her film, will also perform a movement piece with fellow choreographer and dancer Flora Wiegmann. She says that months of engaging with Wright’s architecture has provided a singular experience. But the Sowden house is different, she notes. It was “created for this relationship with art and maybe the cosmos” — its stunning open courtyard making it feel a bit celestial.